Just like his big brothers! For this size of cigar, great value and performance in a compact package! The Red Dot Pequenos was very enjoyable. This was a very smooth, flavorful smoke that burned evenly throughout. A medium-full bodied smoke to enjoy when you don't have an hour + available to invest. My wife joined me on the porch when I was about half way through and commented on the pleasant aroma. Smooth med-full bodied smoke. I actually prefer and like more than montecristo white series robust. Tried one tin, bought another three the next day. Its nice i can fit a truck load in my humidor and not have to keep going to the local smoke shop everyday. Affordable, mild, consistent, 20 minute smoke. Nice little 20 minute smoke. They pair well with coffee in the morning or anytime a mild, quick smoke is in order. Love these sticks when there isn’t much time to enjoy. All the flavor of their bigger brothers in a small package. Plus the tin is nice to carry to keep them undamaged when traveling. 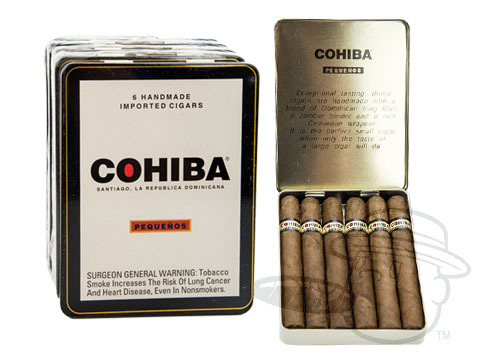 Cohiba Red Dot Pequenos is rated 4.5 out of 5 based on 19 customer ratings.